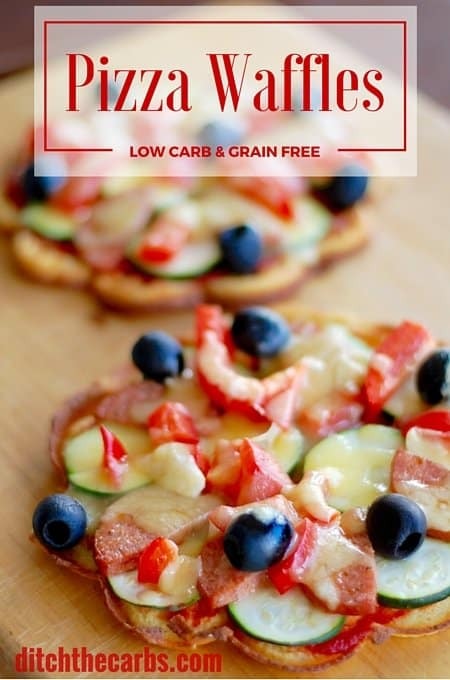 Low-carb pizza waffles – nut free, grain free, gluten free and incredibly easy with no protein powders and nothing you won’t have in your low carb pantry. Scroll below to watch the new cooking video just added. This makes these award winning waffles virtually fail proof. Have you tried my recipe for FatHead pizza? It has become THE most downloaded recipe for the entire website. As a result of this, many readers have been asking me for a nut free version so children can take it to school, or for those with nut allergies. Well I think I’ve cracked it with these low carb pizza waffles. It’s actually embarrassing how many times I have now made these. I’ve learnt to make a double batch and freeze the remainder for school lunches. Waffles are so versatile. 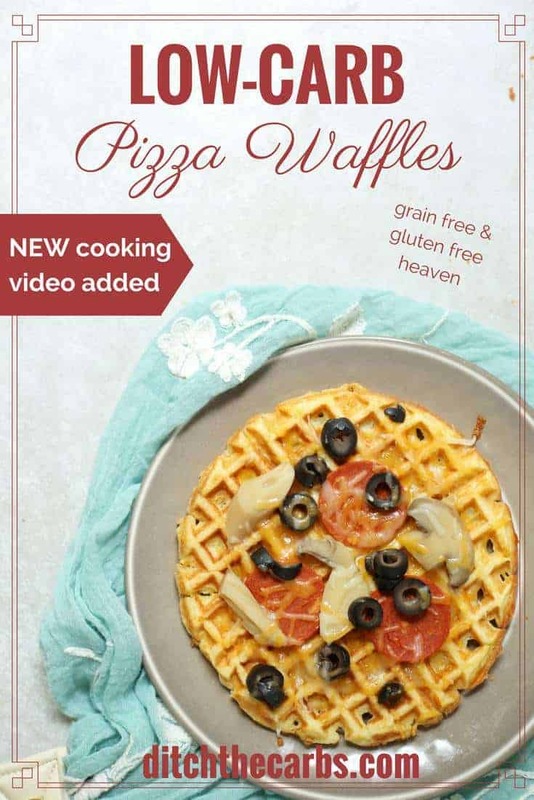 I freeze the remaining low-carb pizza waffles in an airtight container with a piece of baking parchment in between each one to stop them from sticking and it is easy to remove 1 or 2 at a time to defrost. 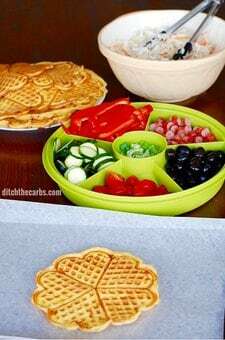 You can even cut the pizza waffles in half and use as a sandwich with your choice of filling, or grill with some toppings then pop in your lunch box once they’re cold. TOP TIP :: For birthday parties and sleepovers, I make the pizza waffles in the morning or a day ahead. When it’s time for pizza, I leave all the toppings out and let the children load theirs up any which way they like. Bake the pizzas on baking parchment, write their name next to their pizza waffle and they are guaranteed to be eaten. Such a simple idea and such a popular one. Even the carb lovers love these. Always make double low carb pizza waffles. Save the leftovers for school lunches the next day, or freeze them. They can be cut in half and used as sandwich bread. Fill with cheese and ham. YUM. Mix the egg yolks, coconut flour, salt, herbs and baking powder. Add the milk and grated cheese. Mix well. Gently fold spoons of the whisked egg whites into the yolk mixture. Try to keep as much of the air and volume as possible. So what toppings would you put on your Low Carb Pizza Waffle? And what other ideas do you have to use the waffles? These waffles are my ‘bread’ and I use the recipe all the time. I change it around sometimes adding almond meal, LSA and/or psyllium and no cheese. The egg whites wouldn’t stiffen one time, so I just threw everything in together and it worked! Thanks so much Libby for this recipe and heaps of others. I’ve been wanting to try the pizza crust recipe but we don’t eat dairy. Can we mSke this dairy free? Thank you for this recepie. Do you know how many waffels i can make with this batch of batter? What can be used in place of the coconut flour? My hubby is allergic to nuts and coconut is one…what goes down must come up when he gets enough. Coconuts are actually drupes not nuts so maybe an alternative might be to use this recipe or the FatHead pizza recipe and try ground linseed and psyllium husks instead of coconut flour. You’d have to do a bit of experimenting (which is why recipes take so long to develop) but let me know if it works. That would be great for others who can’t tolerate coconut. Hi Libby! Question for you – is the cheese added just for flavor or is it integral to the structure of the waffle? I’m dairy free for now. Sorry I hate when people ask for a zillion subs but I just can’t tell with this recipe whether the cheese could be left out or not. Thank you! The cheese is there for both flavour and structure. It’s what makes it crispy and ‘pizza like’. Would I be able to substitute the coconut flour for almond flour? If so, what would the ratio be? Libby, about how thick are your waffles? I have a professional style “flip over” waffler which produces thick waffles with a traditional batter and I am concerned it will cause porosity in these waffles as this is a more non-traditional batter. Yours appear thin and crispy. I am using my old waffle make that I used to make regular waffles in with the same volume and these bake brilliantly. 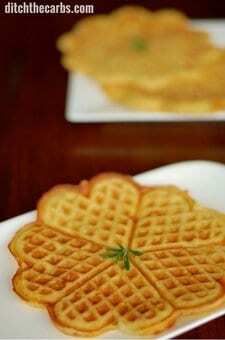 Give it a go in your waffle maker, I’m sure they will turn out just great. I think mine look thin in the picture as the photo is taken across the ‘cut line’ and so the thinnest part. Love this idea… I’d like to give it a try. What kind of grated cheese do you favor for this recipe? I usually have a block of Edam, mozzarella or haloumi in the fridge. I also like feta on my pizza waffles with olives, courgettes and mint. what waffle maker do you use? i love the look of yours. they seem thinner than regular waffles. Cuisinart Classic Waffle Maker is very similar to mine. Could you use HWC in lieu of full fat milk? Absolutely. The waffle may be a little heavier with the HWC so possibly add an extra tablespoon. Try a test waffle first then be guided by that one as to how much HWC to add to the mixture before cooking the rest of the batch. good morning. i was just wondering, i don’t drink cows milk but i do drink almond milk. can i use that instead? There may not be enough fat in the almond milk so it may make the waffle mixture too runny and liquid. Start by adding a small amount at a time until it is the constancy that cooks well. Even try a ‘test waffle’ as you can always add more almond milk rather than try to thicken up a runny recipe. You’ve done it again Libby ! Many thanks – they look fantastic. Could you simply cook these on a hot griddle if you don’t have a waffle maker? Sure. Im sure that would work. I just love my waffle maker as they crisp up really nicely. You’ve done it again, Libby . Been so busy trying all the great things I don’t have to do without that I haven’t given you any feedback . Like you and your waffle maker, I saw this and thought of our Breville sandwich toaster . It’s got two flat surfaces and seemed ideal for my purpose, which was tortillas / wraps . Worked a treat ! Two heaped dessertspoons of the batter in the centre, close the lid on the ” Toast ” level, wait about 30 seconds and voila ! They turn out ~200mm – just a nice size on a dinner plate . Scoop up with an eggflip and put on a wire rack to cool and Bob’s yer uncle . I used garlic and herb salt, and Pizza Herbs, btw . You’re a star Martin. 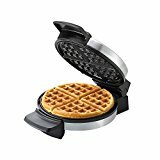 Many have been asking if they can use an alternative to a waffle maker and you have done the experiment for me – a sandwich toaster! And I love your use of garlic and herbs – awesome. 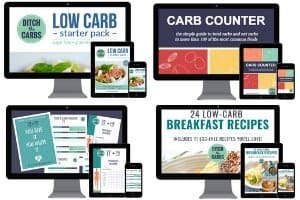 Please can i have a low carb bread recipe. Looks good. Can you also cook in an ordinary fry pan as a pancake or will it cook up too thick. Yes yu can cook these in the frying pan. 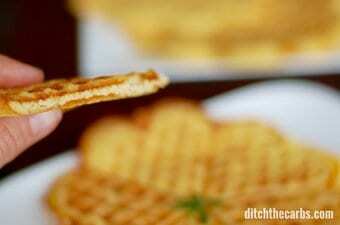 They may not crisp as well as a waffle make does. Hi Libby, can I make these without a waffle machine – like in a toaster (for toasted sandwiches) ? Or another way? Thank you. Hello Libby, I love your site! You make it so interesting & full of great info. Thanks so much. Oh, could you tell me what is Xocai chocolate that Jae mentioned. Haven’t heard of it here in Sydney but it may be under another name here.